Hmm… poached eggs made simple? Is that even possible? Many people, including myself, will shudder at or shy away from making poached eggs because it seems so difficult. When we do give it a go, it turns into a gooey mess, or they look unattractive with all those ugly looking tendrils. 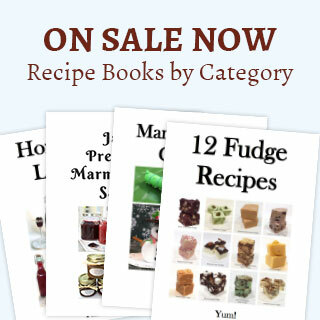 How can we make it all much easier, better yet foolproof? Well, I have a way that you’ll love, and it works every dang time. 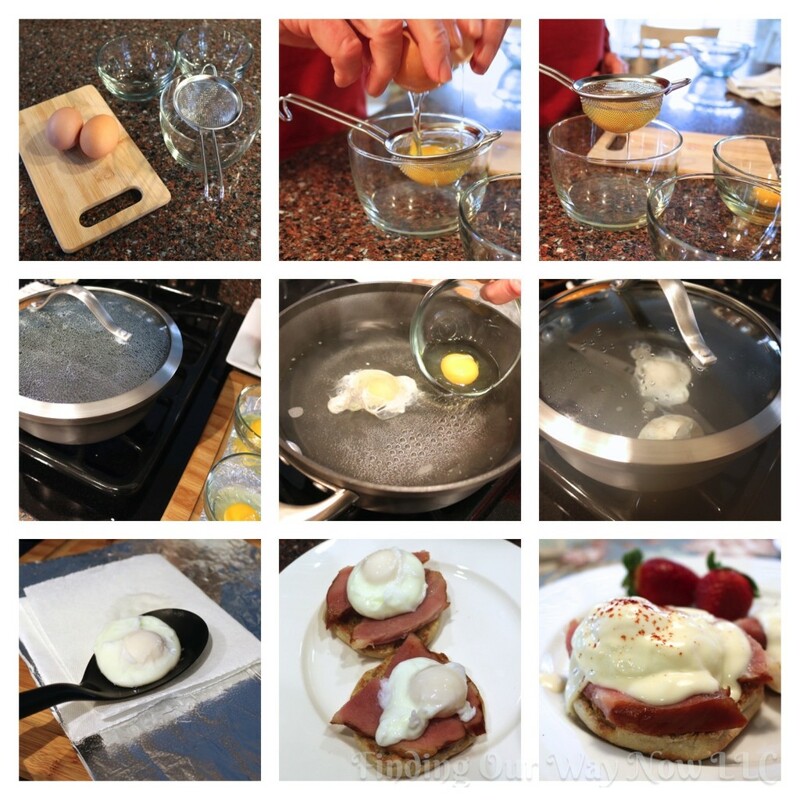 With this cool new poached egg method, let’s make some Eggs Benedict using my No-Fail Hollandaise Sauce… Yum. So let’s get started. Place your raw egg in a small fine mesh strainer over a bowl, tip the strainer around a bit, tap it several times on the edge of the bowl. 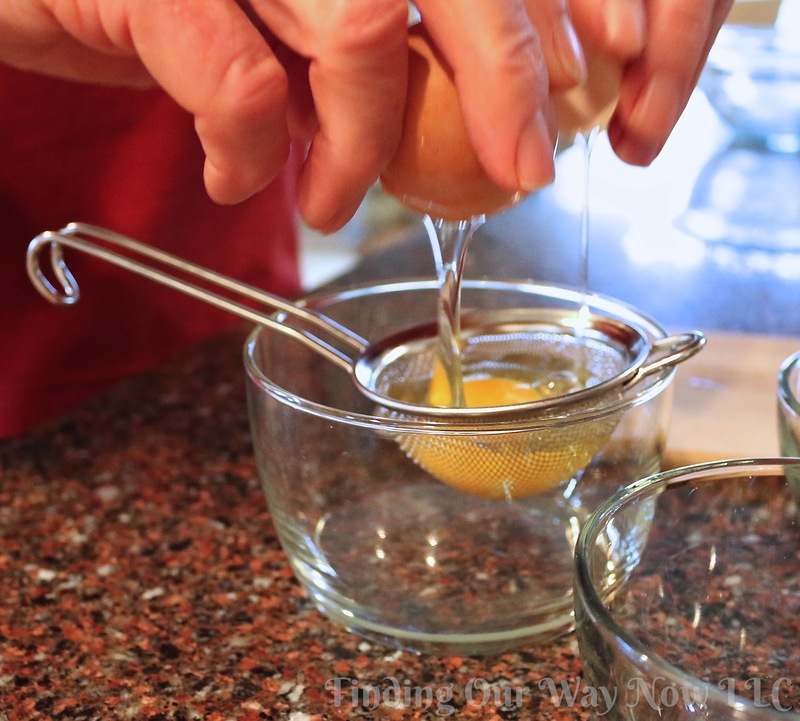 This process will help the thinner part of your egg whites fall through the strainer. Gently pour the remaining egg in a small individual bowl. Repeat the process until you have the number of eggs you desire to poach. Discard the strained watery egg whites. Bring a saucepan of water to a steady boil. When ready, turn it off and gently pour the individually strained eggs into the hot water. Cover the pot, move off the heat and let the eggs cook for 3 ½ to 4 minutes or until they are just the way you like them. Remove the poached eggs with a slotted spoon and tap gently on a paper towel to remove excess water. And there you have it, a perfect poached egg. Once your eggs are poached, arrange your toasted English muffins or bread of choice on a plate. 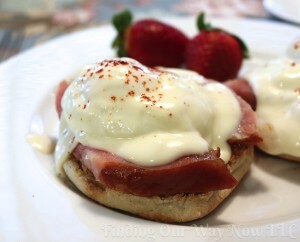 Add ham, Canadian bacon or meat of choice, top with your poached eggs and pour on my homemade hollandaise sauce. Adding a side of fruit is always a good thing. Voila, you have a pretty eggs benedict that will impress anyone. Notes: Using cold eggs from the refrigerator works just fine so don’t worry about bringing them to room temperature. There is no need to add vinegar or salt to the water. Equally, there is no need to swirl the water. It’s simply not needed. How cool is that? One last thing, don’t be tempted to lift the lid of the saucepan with the eggs, it will slow the cooking of the eggs. So when you want to make some poached eggs – plain for another dish or for Eggs Benedict – and aren’t confident about poaching your eggs, give this a try. You will have a bit of fun and love the outcome. 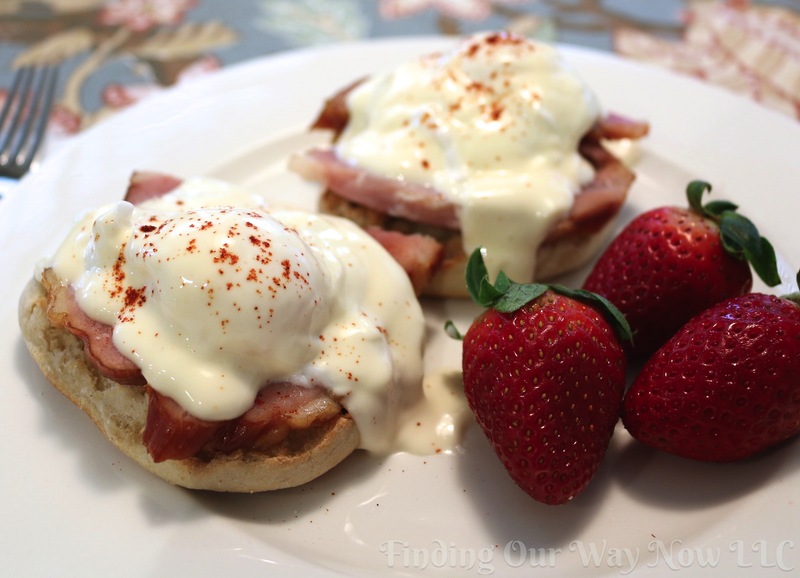 Just think how cool it would be to make eggs benedict for your family or friends. You will become an instant hero with this technique. If you enjoyed these “Poached Eggs Made Simple,” check out my Eggs In A Cup, Make Ahead Freezer Biscuits and this Ham and Cheese Mini Quiches.